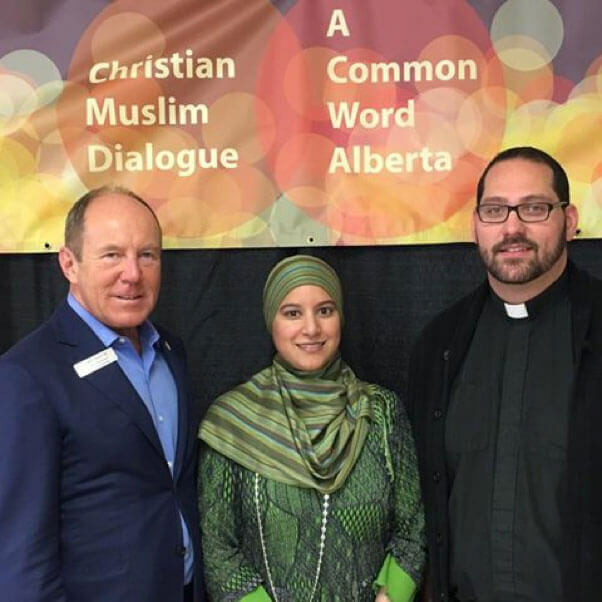 Common Word Alberta hosted the fourth annual Muslim-Christian Dialogue at Edmonton’s Al Rashid Mosque on Oct. 15, 2016. Muslim and Christian representatives of indigenous, settler and refugee groups told their stories and spoke to the question, ‘How does our specific faith shape how we live mercifully together?’ Two recent Syrian refugees, one Christian and the other Muslim, spoke compellingly about the Christian legacy of their homeland. Pictured from left to right: Kerry Diotte, Member of Parliament for Edmonton-Griesbach, and event emcees Farah Jamil and Scott Sharman.